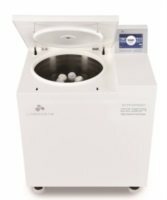 ScanSpeed 1096R is a multi-purpose, floor standing, high-speed refrigerated centrifuge designed for large volume daily-working processes such as high-throughput sample preparation. It comes with a large assortment of rotors, buckets and adaptors supporting diverse applications doable with one instrument. The centrifuge is ideal for diverse applications of clinical, industrial, academic and scientific separation needs. Up to 10.000 RPM (14.981 x g) with 6x250 mL tubes and 5.000 RPM with filter plate set. Intuitive control interface with numeric input buttons allows easy setting and editing of running conditions. The compressor's off-function when the lid is open minimizes unnecessary cooling and frosting. The design of the lid drop protection allows easiness and safety when loading and unloading samples. Only a gentle touch is sufficient to close and open the lid due to the motorized lid mechanics. The short working height of 84 cm ensures easy loading and unloading. Selectable time mod at "set speed" for counting running time only when the set speed has been reached. A separate "PULSE" key for quick spin. Parameters can be changed during operation. Key lock function secures the parameters during operation. A windshield rotor with lid is available for large capacity swing-out centrifugation. Adaptors are available for blood fractionation of variable sizes for blood bags or blood collection tubes. Specially designed buckets are available for 100 mL glass tubes to analyze oil, milk, fat, toxic components, impunities etc. ScanSpeed 1736R is a floor standing high-speed refrigerated centrifuge designed for large volume daily-working laboratories. It has program memory for 100 protocols and automatic rotor recognition. As well as acceleration/deceleration ramps, pulse spin function and lockable castors for safety and ease of location. A large assortment of rotors - both fixed angle and swing-out catering -, buckets and adaptors are available and support diverse applications doable with one instrument. The centrifuge is ideal for all kinds of basic and analytical experiments such as phenol extraction, NA preparation, cell harvest, precipitations, density gradient separation etc. Up to 17.000 RPM (32.310 x g) with 6x50 mL tubes and 8.000 RPM (11.305 x g) with 6x500 mL tubes. Fast cooling function to 4°C in 5 minutes for fast start up of cooled samples. Selectable time mode at "set speed" for counting running time only when the set speed has been reached. An extensive rotor choice catering for microtubes to 6x1000 mL bottles in fixed angle or swing-out formats as well as a large assortment of buckets and adaptors. Therefore, the centrifuge supports diverse applications doable with one instrument. It comes with lockable castors for easy levelling and cleaning. The centrifuge is designed for multi-user environment and is ideal for large volume harvesting in cellular and molecular biology works, clinical preparations, industrial applications, academic- and scientific separation applications etc. Therefore, it is ideal for a wide range of experiments from simple precipitation and separation to filtering, concentration, precipitations, density gradient separation etc. Up to 22.000 RPM (54.111 x g) with 6x50 mL tubes and 7.000 (10.825 x g) with 6x1000 mL bottles. Instrument lock/unlock by password control and protocol management by user ID. Therefore, ideal for core laboratory facilities or multi-user environment. Window CE based 7" LCD touch screen with simultaneous display of all parameters of set and actual values. Up to 5 protocols per run can be combined for convenient operation of complicated experiments. The parameters of time, temperature, acceleration and deceleration can be changed during operation. For further information about LaboGene's centrifuges, please download the below brochure.